From 4 February, some of the worst polluting vehicles will be charged to enter Greater London under the Low Emission Zone regulations. The Low Emission Zone (LEZ) is an area covering most of Greater London, within which the "dirtiest" vehicles will have to meet specific emission standards. If they do not, then they will be fined or have to pay a daily charge of £200. London Mayor Ken Livingstone is introducing the LEZ to tackle London's poor air quality. Transport contributes about half of all the air pollution in the capital. Transport for London has said there are about 1,000 premature deaths and about 1,000 hospital admissions as a result of poor air quality. The mayor hopes the LEZ will reduce emissions overall by 16% by 2012. The LEZ will also help the mayor meet targets in the European Union's Air Quality Framework Directive which tackles the emission of 12 air pollutants. 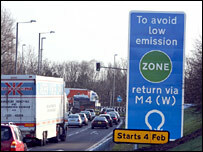 Registered vehicles will have to pay £200 a day to enter the zone. If the vehicle is unregistered and does not meet the emission standards, the driver will be fined £1,000, reduced to £500 if settled within a fortnight. Cars, motorbikes and small vans are NOT affected. Older diesel-engine lorries, buses, coaches, large vans and minibuses (over 8 seats and below five tonnes) will be charged. The scheme initially requires vehicles of over 12 tonnes to meet Euro 3 emission standards for particulate matter - basically tiny pieces of solid "dirt" churned out through engine exhausts. Operators of vehicles between 3.5 and 12 tonnes still have until 8 July to become compliant under a phased introduction of the zone. The LEZ will also include motorised horseboxes, breakdown recovery vehicles, refuse collection vehicles, gritters, road sweepers, tippers, removals lorries, fire engines and some Land Rovers. Motor caravans, ambulances and large hearses are also included. The LEZ applies to all such vehicles, irrespective of whether they are used for commercial or private use. To find out if your vehicle complies to the emissions standards click here. Or call 0845 607 0009. What has been the reaction to it? 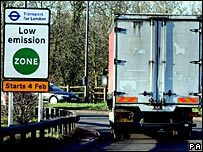 The Road Haulage Association and the Freight Transport Association have opposed the scheme, saying it was costly to implement and would bring few benefits. 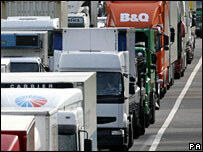 The St John Ambulance also said it was concerned about the cost, because many of its vehicles will be affected. The London Assembly Conservatives and the Lib Dems on the London Assembly said they welcomed the LEZ but had concerns the implementation of the scheme had been rushed. The Federation of Small Businesses said many of its members were still unaware of the scheme. The proposals were welcomed by the British Lung Foundation, the British Heart Foundation, the London Cycling Campaign and London Living Streets, which represents pedestrians. But the Green Party on the London Assembly said the LEZ does not go far enough. The LEZ zone will be monitored using Automatic Number Plate Reading Cameras (ANPR). Vehicles entering or driving around the zone will be checked against the records of the Driver and Vehicle Licensing Agency (DVLA) to see whether work to comply with the zone standards has been carried out. For vehicles abroad, an international debt recovery agency will be used to obtain unpaid charges and fines. The LEZ will operate 24 hours a day, seven days a week, everyday of the year from 4 February 2008. Haulage firms have been given extra time to adapt their lorries to meet the anti-pollution rules. Firms will be given up to 28 days after the zone comes into effect to ensure their vehicles meet "green" standards. After that, there will be a phased introduction over the next four years with more vehicles and stricter emission standards being brought in.